One of the most challenging aspects of our job, is keeping up the ever-changing Recology mandates. Here in the Bay Area we have some strict rules about what goes into the Land Fill > Compost > Recycling. You can use black trash liners in the landfill bins, but not the recycling, those have to be clear. Compost liners are costly but do help to cut down on the smell and you don’t have to wash the can as often and the list goes on. Most people don’t think about what goes into which cans until their garbage company sends them a letter and usually (if it’s a repeat offense) a huge fine. For the restrooms – paper towels only in the bins. They are not to be lined and they are to be put into the compost / green bin. Recycle / Blue Bins – no can liners. Commonly accepted recyclables include: paper, plastic, cardboard, and aluminum. You do not need individual bins for recycle. The items below can all be put into the same cans. Land Fill: Black Bins –clear or black garbage liners. This is everything that is not recycling or compost. But be sure not to throw away batteries or light bulbs! Those must be handled specially. The info below is a handy guide that you may want to hang in the kitchen or wherever you have multiple bins. Compost –The list is long and varied. One of the things you want to make sure to do is shred those papers. Composting can take a while, you don’t want a full sheet with account information on it, just sitting around in a pile of dirt. Shredding the docs allows them to break down even faster while providing the necessary security. If you have questions or want to host a training session for your employees, most county waste management programs offer onsite training. A common misconception in our business is that your janitor will sort through your trash for you… NOT SO. We will make sure the liners are the correct type and will dispose of items into the proper totters. The most important thing you can do is train your employees. Make sure everyone is on the same page and helping to save the earth and the company some $$. It’s cringe-inducing to wonder who last handled your cash or coins. A sick drugstore customer buying medicine? A child sticking the quarter in his mouth? A person traveling straight from the bathroom stall to the vending machine without stopping at the sink? New York University researchers found in 2014 that a dollar bill carries about 3,000 different types of bacteria, so wash your hands after shopping. Washing your hands is a great step in preventing illness, but where you dry them must be clean, too. University of Arizona researchers found in 2014 that 89% of kitchen towels contained coliform bacteria, and 25% contained E. coli, which gets introduced to kitchens by uncooked meat. After each use, machine wash towels using warm water for colored towels and hot water for white ones. Doors get us from point A to point B, and they open our microwaves, ovens and refrigerators. But in 2014, University of Arizona researchers found that one germ-infested doorknob could spread a virus to 40-60% of a workplace staff within two to four hours. Microbiology professor Charles Gerba said people can stop the spread anywhere with a simple item: Disinfecting wipes. In the studies, the wipes alone reduced occurrences of the virus by 80%. Phones, tablets, TV remotes and gaming controllers all spend hours in our hands, and they’re germy. We pass around TV remotes and video game controllers while stuffing our mouths with food. And our cell phones, which follow us everywhere, contain 18 times more than the amount of germs you’ll find on a toilet handle. Debate continues on how to clean a phone or tablet without harming the screen, but the New York Times offers ideas you may try at your own risk. We finish touching our light switches after a quick flick, but nonetheless, they’re communal locations that everyone lays hands upon. Studies show light switches can have as many germs as a trash can. Run a disinfecting wipe across the light switch to eliminate the germs living there. We’ll save you the stomach-turning specifics, but just know that underwear introduces bacteria to the washing machine. And when wet laundry sits in there after the cycle, the bacteria invades, according to ABC News. Use hot water (140-150°F) or bleach to wash your clothing when possible. When it’s not laundry day, run a wash cycle with bleach and no clothing to rinse your washer. Always wash your hands after handling laundry. 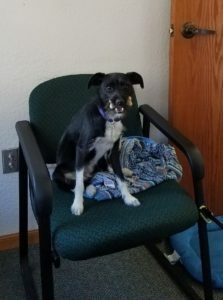 Do you allow dogs in the office? It is becoming a more popular practice. Personally, my Ava Louise comes to work with me every day. She takes her job seriously. That patch of sunshine isn’t going to nap alone. 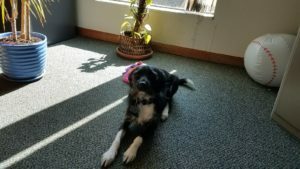 And everyone that walks in to the office gets stopped for kisses and belly rubs. There are pros and cons to allowing pets in the workplace. Allowing owners to bring their pets to work also provides a significant financial benefit—it eliminates the additional costs of doggie daycare or dog walking services for employees who work long hours or commute a significant distance from their home each day. Daycare or walking services can be quite costly, so this can be an excellent perk for a pet owning employee. A pet-friendly workplace tends to increase employee satisfaction and to improve morale. Pets are also a point of common interest that can help to promote an atmosphere of teamwork and communication. Dog-friendly workplaces can cause a serious medical problem for employees who are allergic. For most, the allergy resides in the pet’s dander, which is secreted through the dog’s saliva, skin, and hair. Dander can travel through the air, so an allergic employee can be exposed even if he or she tries to maintain a distance from the pooch. Vacuuming regularly, which is often offered as a solution, may help some, but it is probably not a cure-all. Professional janitors have the tool to handle any dirt (or muddy paws) you throw at them. HEPA filters are your friend (see https://www.tsmaintenance.com/hepa-filters-often-change ). so have cleaning supplies (spray cleaner and paper towels) available. Then, call your janitorial company and give them a head’s up to bring the spot bot with them on their next visit. Mark the area with a note and give that dog a written warning from HR. 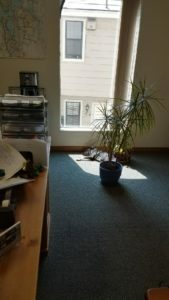 Obviously there are a lot of things to consider, when considering a dog-friendly workplace. Don’t let fear of dirt and hair be one of them; Hire a professional cleaning company, Good dog! 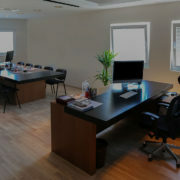 Here at T&S Maintenance, we often contact businesses that currently have janitorial services through another provider. Many times the companies that we contact are relatively happy with their current service. Believe it or not, it is still worthwhile for us to put together a free, no obligation estimate for our services. The reason we are willing to put together an estimate is that you never know what might happen to the current service. For Matt and I, putting together this free, no obligation estimate is of not an inconvenience to us. With our twenty years of experience, we have found that companies need to make unexpected changes for a variety of reasons. We’ve seen companies need to make changes due to family emergencies, moves, acquisition of new accounts, financial difficulties, etc. If one of these unfortunate situations were to arise with your provider, you would have a detailed service and rate in your file. It is like having an insurance policy for janitorial services. If you would like to receive a free, no obligation estimate, please fill out the request for quote form and we will happily contact you. Your plan for maintaining clean restrooms should include periodic cleaning tasks that either take a little more time than daily cleaning or require the restroom to be closed for safety. These detail restroom cleaning tasks include but may not be limited to floor scrubbing, dispenser maintenance and high dusting. Detailed fixture cleaning is another essential task and steam cleaners are ideal for this task. The reason it is a good idea to include these tasks in your overall restroom cleanliness plan is that they serve as preventive maintenance. By scheduling this periodic restroom ‘deep cleaning’ you reduce the chances of having to perform restorative cleaning, which requires more time and effort. Because many of the tasks involved with periodic deep cleaning of restrooms take more time than typical regular cleaning, it is a good idea to schedule this work when the restroom is at a low traffic time or when it is possible to close down the restroom all together. Wet floors and equipment can also be potentially dangerous for restroom users. Plus having the restroom closed allows the cleaning staff to work uninterrupted. Periodic detail restroom cleaning should include anything that cannot be done during regular daily cleaning. There are always those tasks that simply are not possible to accomplish or do not need to be done every day. A perfect example is floor scrubbing with a compact auto-scrubber. Every type of floor requires some type of scrubbing from time to time. It is not usually practical to scrub a restroom throughout the day and for most facilities floor scrubbing on a daily basis would be overkill. But weekly or bi-weekly makes sense. Every facility is different and has different traffic patterns. The times and the tasks that are needed will very. The important thing is that periodic detail restroom cleaning is included in your overall restroom cleanliness plan. When it comes to deep cleaning restrooms, there are several tools that can make the process easier. Before mechanical scrubbers and high pressure cleaning systems, we were pretty much relegated to using a hand brush to deep clean floors and baseboards. While the elbow grease methods still works, the use of restroom cleaning equipment makes the deep cleaning process much faster, safer and produces much better results. Rotary floor scrubbers are very versatile when it comes to cleaning floors. In a restroom setting, they are able to quickly deep scrub tile and grout, loosening built up soils to be easily removed. For this application, it is most effective to use a brush rather than a pad. The longer bristles are better able to get down in the uneven surface of the floor. When partnered with the correct cleaning chemicals, a rotary scrubber can make a big difference. Square floor scrubbers are also a good option. These machines have an oscillating head rather than a rotating head. Providing more of a vibrating motion, square floor scrubbers make it easier to control when scrubbing in tight areas like restroom stalls. Also, because they are square, corners are much easier to get into. Turf pads are an excellent choice for grouted areas when using a square machine. Edger scrubbers can be a big help as well. They look similar to a line trimmer, but have a small brush on the base. This makes it possible to get behind toilets and into other tight areas that a rotary or square scrubber cannot. Another type of restroom cleaning equipment are touch free systems. These employ high pressured water, that blast away dirt and soils. Using a controlled stream of water, you are able to deliver cleaning chemicals directly to the areas you need to clean, both to the floor and to the fixtures in the restroom. Areas like stall walls, toilets, urinals and sinks can be quickly and easily cleaned without the user having to touch them. These systems use detailed procedures to do both deep cleaning as well as daily maintenance. Steam cleaners are another method of deep cleaning. Using steam rather than water, difficult soils can be removed without chemicals. Although this is a slower method, it can produce great results on hard to clean areas. Using mechanical equipment to deep clean restrooms provides a cleaner facility, extended maintenance cycles and happier, safer employees. Every trade has its tools and restroom cleaning is no different. Having the proper tools will always make tasks easier, faster and provide better results. So when it comes to above the floor restroom cleaning, such as dusting, wiping and scrubbing, it just makes sense to have the correct cleaning tools for the job. I have always thought of dust as job security for cleaning. No matter where you clean, there will always be dust settling on surfaces. Restrooms have lots of places that dust can be found. Partition walls, window ledges, counter tops and fixtures are just a few of the examples. Controlling dust during cleaning is the key to overcoming it challenges. The old traditional feather duster is only a quick fix that usually just makes more work for later. The better option is to use a damp microfiber cloth or pad to grab and hold the dust. It is important to not use an overly oily chemical for dusting. The residue left behind by the oil can for a dust trapping film on the surface. This will build up over time and be difficult to remove. The film can also discolor surfaces. If you are more of a traditionalist, there are microfiber dusters that look similar to feather dusters that work very well. But keep in mind, that they do not catch all of the dust. Much of it will still be stirred up into the air. The best option for removing and controlling dust is to use a vacuum. Back pack vacuums make it very easy to remove dust from surfaces at all heights. By containing the dust in the vacuum bag, it will not settle back on to surfaces you will need to clean again later. There is only one type of material that is guaranteed to work for wiping surfaces in a restroom and that is microfiber. Because it grabs and holds dirt and soils so well, microfiber cloths, pads and mops make cleaning much more effective. Microfiber is made of synthetic fibers that can also help to prevent the spread of bacteria. When setting up your microfiber cleaning processes, it is also a good idea to use a color coding system to reduce cross contamination. Designating specific colors for specific tasks and surfaces help with staff training and provide a safer working environment. Brush technology has come a long way in the last few decades. Synthetic materials provide a cleaner, more effective means of getting those hard to clean areas without the spread of bacteria. Because they use plastic rather than natural materials, soils can be rinsed away easily and bacteria cannot thrive on them. Scrubbing pads are also a great option along with the newer technology Magic Erasers. These provide optimal scrubbing power without damaging surfaces. Above the floor restroom cleaning is an important factor in the overall cleanliness of a restroom. Having the best tools for the job will make all of these tasks easier, safer and more effective. A frequently asked question that we receive is- what is the difference between my partition glass cleaning and a standard window cleaning; and how are each maintained? Partition glass is considered all the windows inside the main walls. T&S Maintenance will typically define your main windows looking to the outside of the building as “curbside windows”. 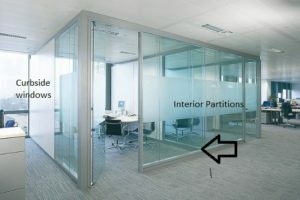 Per a standard janitorial contract the client can expect that their partition glass will be maintained for spots and smudges. A full top to bottom cleaning of the partition glass should be scheduled once a year. Depending on your agreement there may be a fee associated with this service. For your curbside windows, a typical cleaning would almost always fall under the category of an additional service. Depending on the size and location of your building, the exterior curbside windows should be examined every few months to determine if a full cleaning is needed. Typically, the interior of the curbside windows will be thoroughly cleaned on an annual basis. 1) Go digital. Do you really need to print out all those sales reports or meeting notes? By cutting down on printing, or printing double-sided when you absolutely need a hard copy, you’ll reduce those piles of paper that invariably collect on your desk. You’ll save a few trees to boot. 2) Make time. Take a few minutes at the end of the day to dispose of food containers and coffee cups (or wash reusable ones), sort paperwork and gather personal items to take home. 3) Adopt a once-a-week routine. If you’ve reduced the clutter, you’ll have an easier time keeping dirt and dust at bay. Use earth-friendly wipes to clean your phone, keyboard and mouse, and other items you use a lot. And don’t forget your monitor; a soft microfiber cloth is best. Following these tips will make it easier for your janitors to vacuum and dust around your cubicle, and who knows, a little of your sparkle might inspire your coworkers to tackle their own clutter. https://www.tsmaintenance.com/wp-content/uploads/2016/10/TSMAINTENANCE-logo2.png 0 0 admin https://www.tsmaintenance.com/wp-content/uploads/2016/10/TSMAINTENANCE-logo2.png admin2016-10-26 05:00:122017-01-10 21:15:40Is Clutter Killing Your Productivity? Cleaning Up Your Co-Workers Mess? Janitorial Service – It’s not the most glamorous topic of conversation. It’s also not something someone thinks about unless it goes wrong and you need to make a change. What happens when you walk into the restroom at work and see that no, there aren’t secret fairies that come clean up your mess in the middle of the night? Most employees take it for granted that the garbage will be emptied, the carpets vacuumed, and the restrooms clean and stocked with soap and paper. No one likes cleaning their own bathrooms at home, let alone having to clean the ones at work. In my personal experience, you learn WAY too much about your fellow coworkers. Some things are better left to the professionals. Your boss may say that there is no room in the budget for something ‘so frivolous’. While that may be the case, a professional cleaning service doesn’t have to break the bank. Townsend & Styer Maintenance will work within your budget (or lack thereof) to find a solution that works; whether that is once per week, or once per month. Regular disinfection of touch surfaces greatly reduces the spread of germs and bacteria thereby keeping your employees healthier and at work, not sniffling away at home. Your employees will be happy and the workplace will be healthier. https://www.tsmaintenance.com/wp-content/uploads/2016/10/TSMAINTENANCE-logo2.png 0 0 admin https://www.tsmaintenance.com/wp-content/uploads/2016/10/TSMAINTENANCE-logo2.png admin2016-07-07 01:23:122017-01-11 06:20:07Cleaning Up Your Co-Workers Mess? Who is T&S Maintenance and What Do We Do? Townsend & Styer Maintenance was founded in 2001 by Matthew Townsend and Jeremy Styer. The two principals decided that they could provide better service through state-of-the-art products, stellar customer service and the ability to adapt to each individual client’s needs. From restaurants and bars to schools, gymnasiums and Class A office space, Townsend & Styer Maintenance develops customized service plans and strives to exceed all client expectations. We have two locations serving the greater Bay Area. Pricing Methodology – T&S Maintenance customizes each individual proposal based on a number of variables including type of facility, density, frequency of service, type of business and hours of operation. T&S Maintenance will provide all cleaning materials and we ask that the client provide all paper products, hand soaps and trash liners. Additionally, T&S Maintenance can manage your supply inventory thru a third-party vendor. T&S Maintenance prefers that all communication comes through our central office for proper tracking and resolution. We are strictly a full service janitorial maintenance firm. We do not distribute janitorial supplies. We contract with a third party vendor. Yes, we can provide proof of liability insurance and worker’s compensations. As a small local janitorial company, we find that we offer our clients unparalleled customer service, which allows us to nurture long-term relationships with our clients. T&S Maintenance strives to provide each and every client with the latest cleaning services and products. We offer a full line of “Green” cleaning products and will adhere to each client’s recycling and/or composting policies. Would you like to find out more about us? Give us a call to discuss your facility needs and schedule a free, no obligation site visit. https://www.tsmaintenance.com/wp-content/uploads/2016/10/TSMAINTENANCE-logo2.png 0 0 admin https://www.tsmaintenance.com/wp-content/uploads/2016/10/TSMAINTENANCE-logo2.png admin2016-04-04 01:20:442017-01-11 06:19:02Who is T&S Maintenance and What Do We Do?